The Annual America's Claims Event is one of the ONLY industry event where senior managers, practitioners and experts involved with claims operations can get the insight they need to implement effective and tactical strategies for their claims handling process. More than 400 professionals and decision-makers from mid-size to large Fortune 500 companies attend the event to engage in idea exchange and peer to peer learning. Attendees gain deep insight from the experts and obtain unparalleled access to proven solutions to manage their operational challenges. 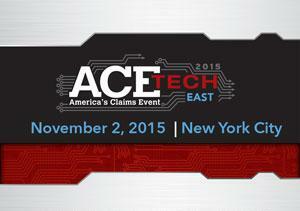 At ACETech, we will delve deep into the overarching trends in claims management and discuss how technology, innovation, and data are being used to tackle the issues that keep you up at night. In the past 20 years we have seen the claims industry evolve from manually operated, labor-intensive occupation to a multi-faceted, highly mobile and service focused enterprise with the help of rapidly evolving technologies and increased communications. With the evolution the industry has seen in the last 20 years, you can imagine what the next 20 will bring! Eager to help professionals stay updated and knowledgeable about the latest trends in the claims industry, the ACE Network of events, America’s Claims Event and ACETech, are proud to introduce the ACE Webinar Series. Seasoned claims professionals and those just starting their careers will benefit from the knowledge gained by attending these webinars.